Back from another quiet spell. I just haven’t had anything to say lately. 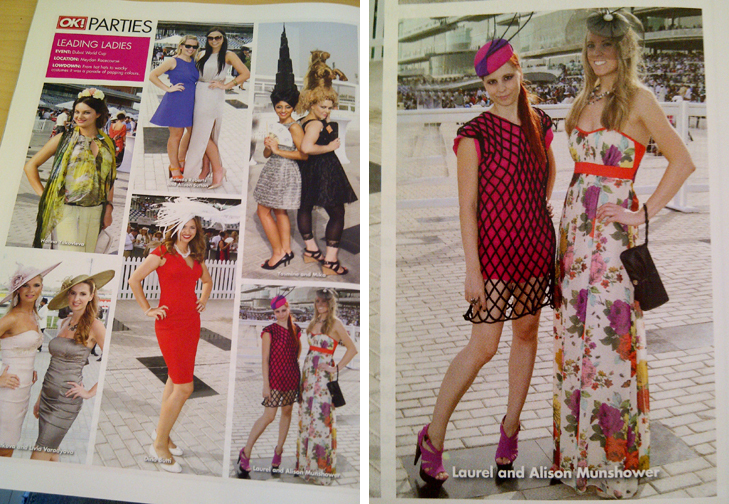 But then, I couldn’t pass up the chance to post up a worthy outfit from the Dubai World Cup horse races this year. Added bonus! My sister & I made it into OK! mag! Really, though, I am forever intending to start writing in this asinine thing more often, but I…just can’t, although things have been busy with work, visitors and moving house over the past couple months. However I can quickly rant about my impending travels to India (in 4 weeks!) being possibly ruined. AGAIN, my passport is out getting a new visa and AGAIN there are huge delays. I turned in my passport 2 months ago to get my new residency/work visa yet there has been almost no progress to speak of (for reasons out of my control). Understandably this does not make me confident that I’ll have my passport and new visa back by mid-April (although I have been assured otherwise). Why do I need it by then if I don’t travel until early May? Because I need to sort out my Indian visit visa before I travel (it can not be issued upon arrival – at least not to the place where I am going) and my understanding is that you should give the Indian embassy 10 working days to sort this out. This means I should really have my passport/new work visa back by April 15 to feel properly comfortable. This is like the Kenya trip all over again (2 months before going to Kenya I turned in my passport to get my new work visa, which should have only taken about 10 working days, however I did not get my passport & visa back until about 2 days prior to travel – nerve-wracking)! I’m so unhappy right now and ready to go ballistic. I turned my passport in at the very end of January, right after we returned from Switzerland, so I wouldn’t have to worry about having my passport back in time for India and yet HERE WE GO. It absolutely infuriates me literally to the point of tears. Incompetence. Laziness. General and overall lack of caring. That all said, I am pretty confident I’ll have my visa and passport back before my holiday begins, in early May. Worst-case scenario, we’ll just go somewhere else where we can simply get a visit visa upon arrival (toying with the idea of doing another trek in Nepal, or maybe even Thailand (although the latter doesn’t really thrill due to the massive amount of tourists that Thailand seems to attract). But…I mean I was really looking forward to a relaxed, tropical, hut-residing, curry-nomming holiday in the subcontinent. Annoying. Hi Laurel! I’m an American-Expat in Dubai too… I went for the first time this year… So much fun. You made the mag, very cool. Love your style! Saw your hat on your blog and was thinking of going with something similar this year but when I found my dress knew I had to totally change my direction!